Unless I’m on a plane, these days I work from home full-time. I know that sounds like a dream to some, but I think working from home is not for everyone. Here’s a few things I’ve learned along the way. 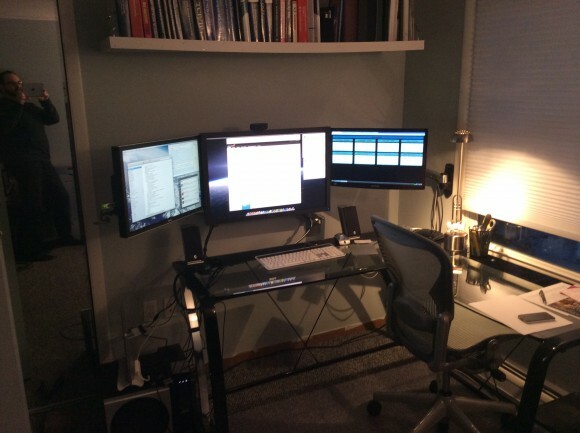 To successfully work from home, I’ve found that being organized, self-motivated, and conscientious is a requirement. I have to understand what’s expected of me, and have to motivate myself to get it done. No one’s there to babysit me. In large part, it’s up to me to either goof off all day, or get my work done. I go to bed at night and get up in the morning such that I can be at the keyboard at a fairly predictable time each morning. When I break from my routine (such as the last week or two when I was getting my home lab off the ground), I’m just not in a very good mental state. So, even though my commute consists of a walk across the hall, I still stick to a schedule. This goes hand in hand with being self-disciplined. I’m not in the office, but I’m in the office. I have a job to do, and part of that job means being accessible to my co-workers or equipment that need my attention. So, I’m in a chatroom with co-workers all the time. My IM client is up with an accurate status when I have the presence of mind to set it. When people call me, I pick up the phone. When I’m scheduled to be in a meeting, I’m there (unless I space it, which happens once in a while). If I forget, I feel like a tool, because being responsive and participatory is important to me. If a customer or vendor pings me, I respond. I believe that being responsive is key to demonstrating that you’re engaged. The trouble with not being in the office if everyone else is in the office is that they can forget about you. Physical presence can make a difference if you’re a quiet person. Which I am. So, I have to force myself to initiate contact with my co-workers through e-mail, remember to fire off an IM once in a while and see how folks are doing, participate in chat rather than lurk, etc. I am not very good at this. I always feel like I’m bothering someone, or that folks are probably too pressed with things to do to want to interact with me. That’s my introverted nature. At the same time, I know that I need to stay in touch with folks I don’t see in person more than once a quarter or so. I believe the contact matters by helping to cement the working relationship by demonstrating I’m engaged in the organization. There’s a stereotype that folks who work from home are in their jammies and bunny slippers, looking like they just got back from a bender. I can’t function well in my bunny slippers. So, my co-workers might be glad to know that I follow a standard hygienic regimen working from home or not. I don’t just roll out of bed and gollum my way across the hall to the office. I get up and get moving, just as if I was about to get into the car and commute. Most days, I even wear a collared shirt. Not every day, mind you. But most. I find that going through that morning routine makes the work day to be clearly the work day. It puts me in the right frame of mind. And besides…video chat. I took the smallest room in my house and converted it into my office. I have gone to a lot of trouble here, because I’m in this room for hours a day. I invested in good office furniture and wall-mounted monitors on articulated arms. I have invested in decent lighting. I ran extra network cable in here, and need to run some more now that I’m working against a different wall than when I first moved into this space. Yes, it cost money. That said, it was money I consider well-spent. I enjoy coming in here to work every day. And importantly, this room has a door. If I need to, I can block out the rest of the world. I know not everyone will be able to set up such a space. Perhaps I’m fortunate. I know I didn’t always have my own space. But I can say that if you work from home a lot, that office space can make a big difference in your frame of mind and productivity throughout the day. I find it’s very easy for me to work ridiculous numbers of hours if I so choose. I’m comfortable. I like what I do. So, part of my routine is to leave the office at a set time and go into a different room. That breaks the “I’m at work” mindset, and allows me to pay attention to my family. Yes, the shelf is sagging a bit. I can fix that. I *will* fix that…soon. Very soon. Nice article and indeed it is not for everyone ! A trap I often fall is of not having a break in regular intervals; when alone, none around to drag me “out” of my troubleshooting work for a coffee, tea. Do you guys ever find that the social aspect of working from home is difficult, or do you feel like you get enough phone/chat time to meet those needs? I like to be left alone, for the most part, but some water cooler talk is nice too. And if I can ask one more question, what’s your exit strategy for getting out of the work from home environment? Are there enough jobs where you’re located to be able to easily transition back to an office without moving? I admit that I hope to never go back to working in an office environment. I can do it if I need to, although the jobs in my immediate area are not many. I live in rural New Hampshire, and need to drive about an hour to get into a city where there’s decent work. I did that for most of my career, and don’t miss 2+ hours of daily commuting. But…yes, I could if I needed to. I’ll add that my company had quarterly all-hands meetings, and so I fly to HQ for those events. I really, really do enjoy those. The interaction is a good thing, don’t get me wrong. I just don’t personally thrive on a lot of it. Ethan by any chance do you have a Whiteboard you use? I used to have 3 4’x2′ whiteboard panels screwed into the wall, but I found that they just don’t work for me. The idea was to track projects, etc. But what really happened was that I’d write a bunch of stuff on the boards, and they’d just get ignored. My workflow is driven in other ways, typically my job tracking system, my calendar, e-mail & Evernote. I occasionally miss a whiteboard to do a network diagram, but I found a simple pad of paper is good enough for sketching ideas. Any network design I actually give birth to goes into Visio before I actually configure it. So…a long way of saying that I’ve weaned myself away off of the whiteboard, and don’t miss it at this point. I get cabin fever – when I really just want to go into an office, get coffee from the coffee machine and lunch from the cafe, talk to someone other than my dog, dress up a bit and have someone notice, etc! But mostly I love working from home and feel it is definitely the wave of the future. Long time no see Ethan… It’s been a while. Nice article on working from home. I too work from home since I left the city life. I’ve mostly worked from the house for most of the past 12 years or so but still had to contend with going to the office. The last three years or so have been different for me. I worked remotely from one job almost entirely. The next job I had an office at work but only showed up as needed. Now I’m basically a consultant who plans and designs networks and am currently engaged in automating the art of network design and deployments. I really just use a cell phone and my laptop. I have a tethering service from my provider. I have an ip phone, webex, conference bridge, calling card, spare cell phone just in case, VPN accounts. And loads of extra resources even a calling card from back in the day. I live on the iPhone. McDonalds and other hotspots are my friend. I keep a land line for better quality calls. I use lync for IM, file-sharing, video conferences and team meetings. I schedule my day and use the network notebook philosophy as guidebook for my activities. Taken with a few script templates and a little lab access life is very nearly perfect. Projects are Kewl too! If its a name you see today in your life, I’m probably designing their data center for them somewhere. I’ve learned to live off the beaten path at the same time: I do my own electrical work, carpentry, plumbing, woodsman, and even lawn work. The seperate workspace is so important. When I started working from home first I just put a desk into a bedroom but as soon as my kids came along this was not workable. I then took my savings for next car and built a garage with connected office. Designed specifically for the purpose with two Cat6 cables linking back to the house. Put a huge amount of insulation into it so it was warm in winter and cool in summer. My biggest problem now is the number of hours I put in. Because I never worry about traffic issues on the days I work from home I always end up getting a lot of things finished and that equals more hours. Having just started working from home full time in the past couple of weeks, this article is prescient! The “I should be working” vibe I find very strong, especially in the evening. Home office still in need of a another couple of trips to Ikea, but a decent(ish) chair was 1st on my list. And finally, do we have a new photographic genre here; Reflecto-Nerd? Reflecto-Engineer? The slightly less narcissistic selfie? How does a person find that coveted work from home job? My company is moving our data center to a colo and I support sites all throughout the globe but yet am still required to drive to an office. Is it more about culture and mindsets of the individual employer? I think it is about corporate culture as well as individual manager mindsets. In my experience, some managers don’t feel in control unless their direct reports are right there in the office where they can monitor them. Other managers are comfortable expecting their employees like responsible adults on their own. Some companies don’t feel their business model works when employees are working from home. Other companies encourage it or even thrive on work from home culture, as it gives them access to a much broader talent pool. Great post, I love working from home and so many people think it’s because you can just sit and watch TV all day or whatever (I haven’t watched a TV show other than Blacklist lately in months and I see those usually late in the evening).